Now both Gen8 and N54l/40l/36l users hate Gen10 N54l/40l/36l was liked because they can fit 6 x 3,5" drives and have a RAIDZ2 array. I work for >10.000+ enterprises , non of them bough Microserver Gen8. 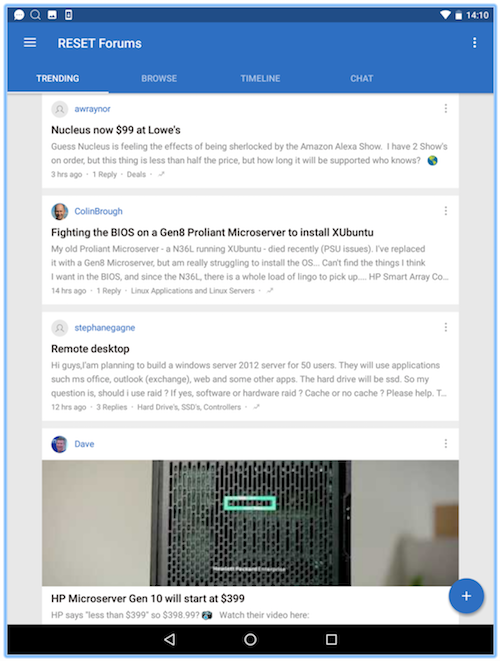 As you say, it did have features, but it is not a server for Enterprises. Can you also test ZFS much liked IBM M1015 controller, to passthrough it to VM ? Most N54l/40l/36l users that did not like MS Gen8 was due to the complexity of iLo, IP, B120i boot from ODD port. M1015 is going to be a problem in the Gen10, due to the tab above the PCIe slots. The SFF-8087 connectors on a M1015 are directly under that tab facing up. It would be a very tight turn on the cable. I cant risk damaging the cable on the beta unit. Also in its current path the cable is too short to reach that far ahead. It may reach if I change the routing. 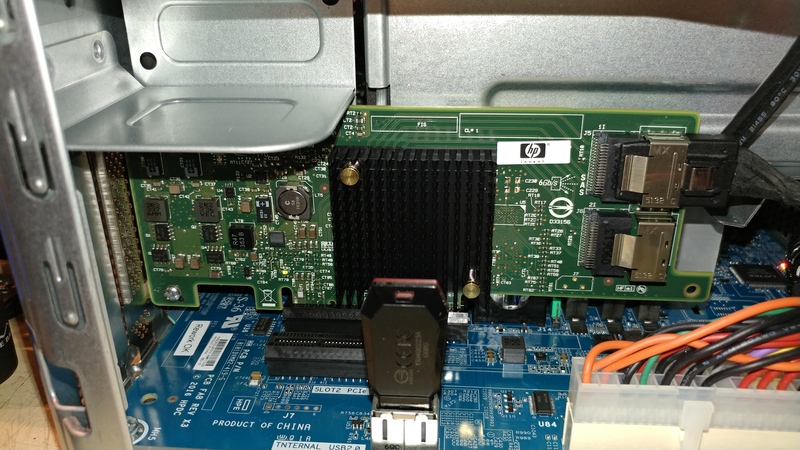 As I found all of my M1015's were not going to work, I bought a HP H220 which is a LSI SAS 9205, in the picture below. For some reason the H220 did not see the drives I was testing. I switched to four Hitachi drives and it sees them. Wasted the better part of a day on that. I also seem to have a red LED on the motherboard now. I think I will be stripping it down and starting over fresh. We've got 150+ Gen8 and a few remaining Gen7 (2 or 3) out and about in customer sites... we bought the RAC cards with the Gen7, and iLo Advanced with the Gen8. We used them to replace aging Dell and HP tower or rack servers (ML/DL, PowerEdge) and ran 2008 Core Hyper-V with a few guest machines... lack of iLo on Gen10 is a killer for us really, and we'd end up looking at towers again I think, even though the other main plus point was a tiny+quiet box that could live anywhere, and which didn't need a rack or a chunk of space. Still want a Gen10 for home though, just because! If I were still rocking the Gen8, I don't think I'd bother with the Gen10, even less so now I've got Frank. Hopefully, we'll see a bit more direction from HPE with the Gen11/12 if they ever arrive, hopefully something with a socketted CPU is next, or, failing that maybe Dell/Lenovo or someone else will step into the hole HPE seem to have left..
M1015 will not work in the MS Gen10 due to cabling. LSI 9205 or 9207 would be good choices. If your card has connectors like the picture below it will not work with the cabling in the MS Gen10. Waiting for info back from HPE. Everything in ESXi under pass-through is listed as 'not capable' including the H220 which I have run pass-through on other HP servers. Checked all BIOS settings everything seems to be in order. Checking for new BIOS or other direction from HPE development team. Schoondoggy, does esxi see a mirrored drive array, I could see using it as an esxi box instead of a converted desktop with 3 mirrored arrays, 2 ssd arrays and 1 spindle storage array. 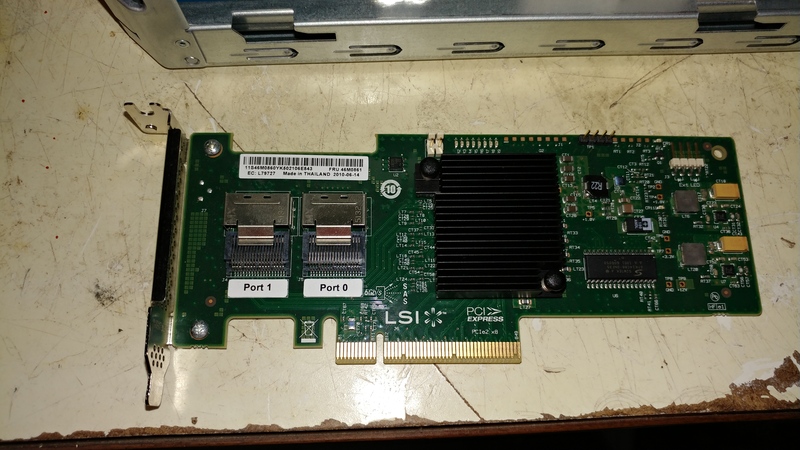 Could put esxi on the internal port, at most add a 10gbe on pci slot. The on board Marvell SATA controller uses software RAID and is not recognized by ESXi. This suggest that maybe this APU is not capable of AMD IOMMU . Lets see what HPE reply about that. Does the CPU support AES-NI? the Gen10 looks like a artificial shrink of possibilities against a lot of Users. The Gen10 got his Usercases but it's not what it was before with low end shrink tech and wasted space. The 6th SATA port is about the only thing I can think of that may be in question. There will be 5 SATA ports on the production MS Gen10.